The global medical membrane market was valued at US$ 2900.45 Mn in 2017 and is anticipated to expand at a CAGR of 9.5% from 2018 to 2026, according to a new report titled ‘Medical Membrane Market: Global Industry Analysis, Size, Share, Growth, Trends, and Forecast, 2018–2026,’ published by Transparency Market Research (TMR). The global medical membrane market is driven by growth of pharmaceutical and health care industries across the world. North America accounts for a major share of the global market, due to growing health care and pharmaceutical sectors in the region. Growth of pharmaceutical and health care industries, especially in developing economies, drives the demand for medical membranes. In the U.S., health care spending accounts for 17% of the country’s gross domestic product (GDP). Health care costs are increasing at a rate twice the country’s economic growth rate. In countries of Europe, where single-payer systems is a norm, health care costs are surpassing the national and regional growth rate. According to the Organization for Economic Co-operation & Development (OECD), health care spending constitutes an average of 9.5% of GDP in case of 34 OECD countries in North and South America, Europe, and Asia Pacific. The average annual growth rate of health care costs for member countries of the OECD is 4.9% (which exceeds the U.S. rate). In China, where most people in the country are insured, health care spending is rising at a rate of 16%. As per the worldwide phenomenon, the capital available to pay for health care is either decreasing or stagnant, while health care costs are rising. The pharmaceutical sector is expected to remain stagnant or witness slowdown over the next 10 years. Medical membrane biomaterials can be defined as substances in therapeutic or diagnostic systems that come in contact with biological fluids. Biomaterials are required to have blood compatibility, size, shape, and porosity, depending on functionality of the final device. Biomaterials need to prevent infection and immune responses, blood clotting, and other biological responses that could affect properties of the biological fluid and the patient’s organ. This calls for long in-process validation to know the host response and the response of materials such as PVDF, PTFE, and PP to a biomaterial. Based on material, the global medical membrane market has been segmented into polysulfone & polyether sulfone, polyvinylidene fluoride (hydrophobic polyvinylidene fluoride, hydrophilic polyvinylidene fluoride), polytetrafluoroethylene, polypropylene, modified acrylics, and others. Polyvinylidene fluoride (PVDF) is the most commonly used material of medical membranes, which is applied for separation of mediums in pharmaceutical, life sciences, biotechnology, and health care sectors. PVDF membranes possess properties such as high hydrophobicity, thermal stability, chemical resistance, and excellent mechanical strength. Key applications of PVDF membranes include sterilizing filtration, filtration of protein-containing solutions, mycoplasma reduction, filtration of gases, and venting. In terms of filtration type, the global medical membrane market has been segmented into ultrafiltration, microfiltration, nanofiltration, and others. The ultrafiltration segment is projected to dominate the medical membrane market during the forecast period, due to increase in the use of the ultrafiltration process technology in pharmaceutical filtration. Nanofiltration is expected to be the rapidly expanding segment of the market from 2018 to 2026. This is because nanofiltration is carried out at reduced operating pressures with increased flow rates. Research & development of solvent-stable membranes has expanded the applicability of nanofiltration in new areas such as pharmaceuticals and fine chemicals, thereby driving the nanofiltration segment. Nanofiltration is a relatively new membrane filtration process technology used for softening and removal of divalent ions, organics, color, bacteria, and viruses. It is also employed in food and pharmaceutical applications. In terms of application, the global medical membrane market can be segmented into pharmaceutical filtration, hemodialysis, drug delivery, intravenous (IV) infusion & sterile filtration, and others. The pharmaceutical filtration segment is projected to dominate the medical membrane market during the forecast period. High rate of incidence of renal diseases, advancements in the medical technology, growth of pharmaceutical and health care industries, and increasing demand for high-purity materials and medicines are driving the pharmaceutical filtration segment. Based on region, the global medical membrane market can be classified into North America, Europe, Asia Pacific, Middle East & Africa, and Latin America. North America dominates the global market, due to growth of pharmaceutical and health care industries in the region. In the U.S., health care spending accounts for 17% of the country’s gross domestic product (GDP). Health care costs are increasing at a rate twice the country’s economic growth rate. Europe constitutes the second-largest share of the global medical membrane market. The market in the region is driven by increasing elderly population, growing pool of patients with end-stage renal disease (ESRD), increasing availability of improved diagnostic facilities, and rising incidence of chronic diseases such as diabetes and hypertension in Europe. The market in Asia Pacific is anticipated to witness rapid growth during the forecast period. Significant growth of the medical membrane market in countries such as India and China is expected to boost the market in Asia Pacific between 2018 and 2026. 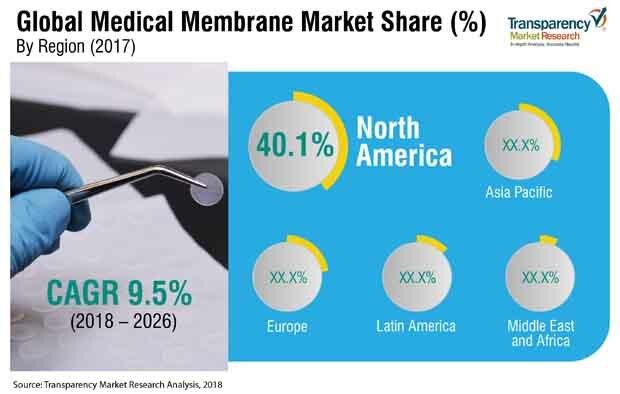 Rising prevalence of diabetes, growing demographics, and expanding medical care industry are expected to drive the medical membrane market in these countries from 2018 to 2026. In China, where most people in the country are insured, health care spending is increasing at a rate of 16% per year. The global medical membrane market witnesses high degree of competition among market players. The market is dominated by large players which are technologically advanced. The medical membrane market is capital intensive and technology intensive. Some of the key players operating in the market are Pall Corporation, Merck KGaA, 3M, General Electric Company, Asahi Kasei Corporation, Sartorius, Cobetter Filtration Equipment Co., Ltd, and W. L. Gore & Associates, Inc.